The strawberry industry ended a long good-bye to methyl bromide in 2016. The fumigant had been used for decades to kill a wide range of soil-borne pathogens, weed seeds and insects, permitting the California strawberry industry to flourish. Scientists determined it was an ozone-depleting chemical in 1991, but its phase-out was delayed for years because of lack of equally effective alternatives. Strawberry farmers now use a combination of approaches, including fumigation with other chemicals, soil oxygen deprivation, biofumigants, and beneficial microbes that improve soil biology. A greater arsenal is needed. 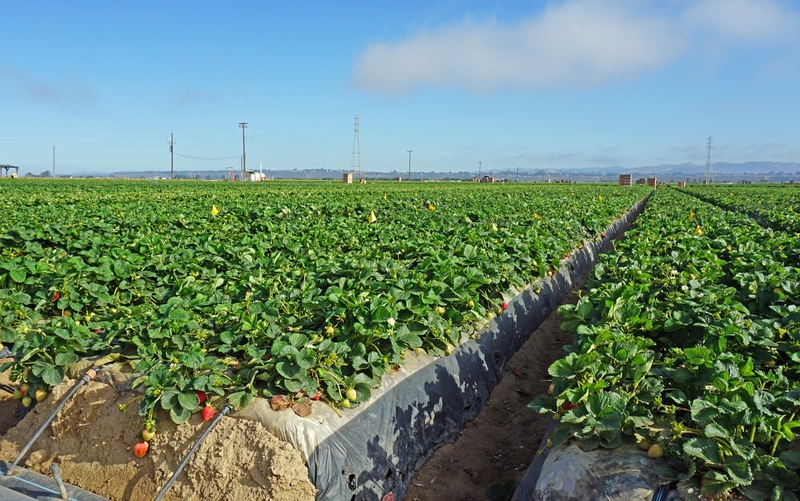 Part of the strawberry field at Manzanita Berry Farms near Santa Maria where UCCE advisor Surandra Dara conducts trials on biologicals and other potential remedies for soil borne diseases, weeds and insects. Nearly 200 pest control advisors, farmers and allied industry representatives attended the UCCE Strawberry Field Day in May. 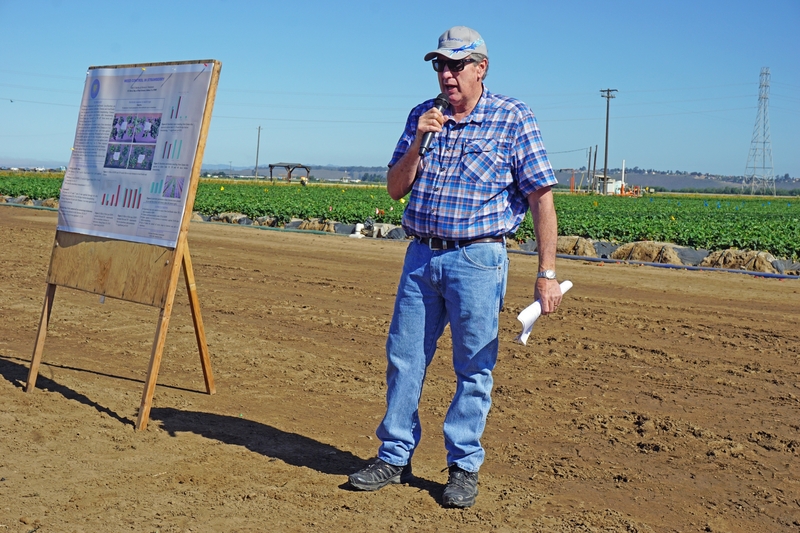 Dara conducts research and advises strawberry and vegetable growers in the Central Coast counties of San Luis Obispo and Santa Barbara. 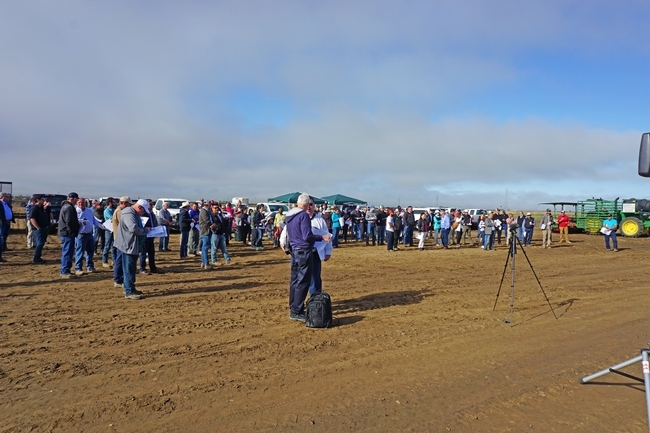 Each year he holds a field day that attracts nearly 200 farmers, pest control advisers and representatives of allied industries to Manzanita Berry Farms outside Santa Maria. 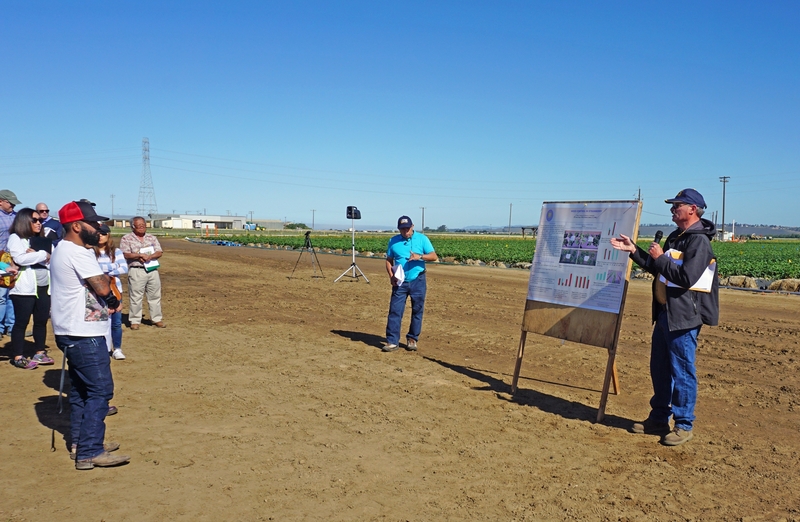 The agenda for the May 9 event included preliminary results of trials studying a number of commercially available and soon-to-be available biological and synthetic amendments to improve strawberry plant health, berry quality and yield. Dave Peck of Manzanita Berry Farms presents research results at the UC Cooperative Extension Strawberry Field Day. 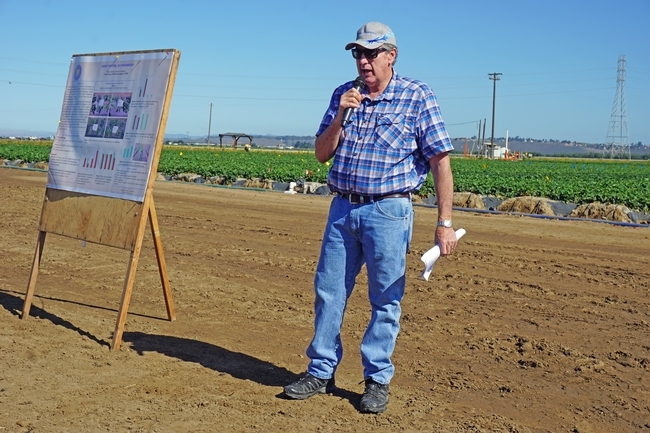 Dara was ill, so Manzanita Farm owner Dave Peck reviewed the handout prepared by Dara for the field day. Manzanita Farms is one of two sites where Dara is testing products in replicated plots. Other studies are conducted in strawberries grown at the Shafter Research Station, a privately managed agricultural research facility in Kern County. Several products resulted in increased marketable yield of strawberries during the February 2018 to April 2018 study period. See the preliminary results here. Data collection will continue through the end of the strawberry season. UC Cooperative Extension specialist Steve Fennimore, right, presented strawberry weed control research results. Rafael Santos, left, provided real-time interpretation in Spanish. 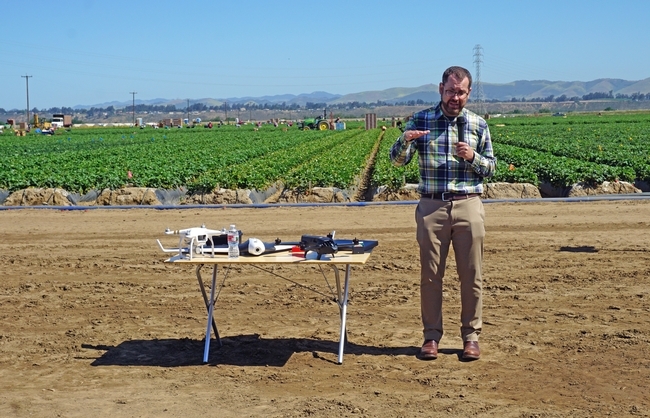 Greg Crutsinger of Scholar Farms said drones can be useful in ag production for spotting variations in crop vigor, where farmers can then sample plants and manage problems.